Joker and Sweet Tooth clown around in Screw Attack’s DEATH BATTLE!! Gingka has seen that kind of look on Yami Yugi’s face before. It is a look of assured victory that he has seen in his friends many times over. Yugi is committed to saving his friends. Gingka smiles back. “Alright, Yugi. Got get him! We’re behind ya!” he says, shooting him a thumbs up. “Very well, Pharaoh. Let us continue!” Azeem said. “With pleasure! Dark Magician!” Yami Yugi said with authority. Dark Magician bursts forth. Again, he is sent back by another wall of wind. While Dark Magician circles the stadium, Yugi tries to think of a way to get through Wind Scorpion’s protective wall of wind. “That wind sent Dark Magician back again! I gotta find a way through it or I won’t be able to find my friends.” Yami, sensing Yugi urgency, sends Dark Magician at Wind Scorpion again. He cannot let Yugi down. He must fight on for him and their friends. Azeem has already ousted himself confirming that he knows about Jonouchi, Honda and Anzu. He likely knows where they are as well. Yami must uncover that information so they can find Osiris and return home. Dark Magician approaches Azeem’s bey. However, Wind Scorpion dodges to the side rather than bring up another Desert Storm Barrier. Yami and Yugi are caught off guard. “Why did he dodge?” Yugi wondered. Just as soon as Yugi’s thought was completed, Wind Scorpion strikes his bey with a vicious attack. Dark Magician is knocked off balance but it remains standing. Wasting no time, Yami commands his bey to strike back. “I can strike back just as hard, Azeem,” he says boldly. However, Yami’s sails are deflated when Wind Scorpion blows Dark Magician away with it windy defense. He grinds his teeth in disgust. “Scorpions are called the hunters of the desert. They have a strong defense with their claws and strike with their tails with astute accuracy. My scorpion can call upon the winds of the Sahara to protect itself. Your magician will not get through, Pharaoh,” Azeem says calmly. Yami Yugi stares down the Wind Scorpion bey. He knows that if he were to attack again, Dark Magician would be repelled by the wind. Azeem has been on the defense since this battle started. The only aggressive action he took was after he had Wind Scorpion dodge that time. Yami Yugi then begins to wonder if Azeem did that because he needed time to set up another Desert Storm Barrier. There was only one way to test his theory. Dark Magician is sent at Wind Scorpion again. 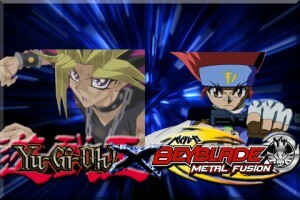 It is pushed back same as before but Yami Yugi wastes no time having his bey lash out again. Wind Scorpion dodges and counters. This time, Dark Magician holds fast and stands against the attack. Sparks fly as the beys bash each other repeatedly until they both strike with equal force and break away. The Dark Magician is sent to clash with Wind Scorpion once more. Desert Strom Barrier protects Azeem’s bey again. But now, Yami Yugi has his confirmation. Wind Scorpion does need time to in between Desert Storm Barriers. However, that is not the only thing he noticed. Unlike previously, the Desert Storm Barrier was slightly weaker this time as it did not toss Dark Magcian aside as far as before. Both Yami and Yugi come to the conclusion that Azeem cannot use Desert Storm Barrier in rapid session. That five second window is what they need to beat Azeem. “Go Dark Magician!” Yami calls out. His faithful servant charges forward. Azeem glares at the purple bey. “That will not work! Desert Storm Barrier!” he says. Wind Scorpion glows briefly before casting a wall of wind around itself again. “Not this time, Azeem!” Yami says boldly. “Special Move! Dark Magic Attack!” The spirit within Yugi’s bey manifests. Dark Magician twirls his staff and thrusts it forward. It clashes with the whirlwind surrounding Wind Scorpion. The intensity of the clash spreads to the tree and plants. Their leaves hold tightly to the branches. Small debris is tossed around. Gingka and his friends cover themselves from the strong wind whipping about. They have seen clashes like this before, especially from any of Kyoya’s battles. Dark Magician pushes hard against Wind Scorpion’s gale forces. Azeem shows the first signs of worry as he watches Yami Yugi’s bey etch closer to his. His Wind Scorpion has used its Desert Storm Barrier too many times in a row and it is beginning to tire. He cannot keep Wind Scorpion’s defense up. He also cannot lose. “No! I will not let you!” he says. “Wind Scorpion!” On command, Wind Scorpion flashes briefly. The tornado around the scorpion bey intensifies and begins pushing Dark Magician back. “Hold your ground!” Yami called out. Dark Magician pushes back against the swirling vortex. Arms raised, Gingka, Benkei, Kenta, and Yu shield their faces from the whipping winds. Meanwhile, Madoka continues to gather information about Azeem’s bey. She has discovered that while Wind Scorpion does have a high defense, it lacks in stamina. According to the readings of her mini pad, creating this stronger wall of wind has dropped its stamina considerably and is beginning to put stress of Wind Scorpion’s performance tip. She determines it will fail soon. Azeem and Yami press the attack strength of their beys. For the moment the battle has become a stalemate until Wind Scorpion’s Desert Storm Barrier begins to ebb. Yami Yugi is quick to notice and even quicker to capitalize. “Now Dark Magician! Attack Wind Scorpion with all your might!” he said, bellowing his command. Dark Magician sharpens his gaze and fires a powerful blast from his staff. Azeem calls upon more power from his bey. Without his knowledge, Wind Scorpion’s performance tip cracks. With a violent burst of air, the Desert Storm Barrier is torn asunder. Dark Magician bey rams Wind Scorpion with such force that it is sent airborne and into the tree behind Azeem who looks on stunned, sending splinters flying. Azeem looks over his shoulder to see his bey half buried in the bark. He then looks back at the stadium. Dark Magician spins in the center. “Azeem! I win!” Yami declared. “He did it!” cheered Gingka. His friends cheer with him as they run up to Yami and congratulate him on his battle and victory. Yami took the praise from them just as he would his friends. Keeping on track, he collects Dark Magician and approaches Azeem who looks at him expectantly. “I have beaten you, Azeem. Now tell me where my friends are,” said Yami. “Yes, as I have said, I will tell you all that I know about your friends, Pharaoh,” said Azeem. “You darn right you’re gonna tell Yugi where his friends are! What kind of guy goes around kidnapping girls anyway? !” Benkei said, snapping at Azeem. Yami gives a stern look. He now knows Osiris is also in this world. If he can find the Egyptian God, he will find his friends. “And where is your master?” he asks. “A thousand apologies, Pharaoh. I can only reveal the knowledge I have. That is something I do not know,” Azeem tells Yami, much to his new friends’ dismay. “They are unharmed and with Lord Osiris. I am unable to tell where they are, however, I will deliver a message from Lord Osiris. You are being judged. Prove your worth.” With that, Azeem turn around and disappears into the trees. Madoka calls to him but the mysterious man is gone and his bey along with him. There is only the indent in the tree where it crashed. The crossover adventure begins here!! Check out my othere stories!! Just click a link and enjoy! !